Want to regain the freedom to move around your home and your yard with ease? Let us perform an inspection today! We will develop a plan to eliminate all ant infestations. While natural ant control, ant traps, and ant baits are all viable options in certain cases, they don’t always work. If you’re wondering how to get rid of ants, the answer is simple: contact an ant control professional. Here at Home Pest Control, we have the knowledge and experience necessary to eliminate your ant problem quickly and efficiently. Plus, you can rest assured that our safe, environmentally-friendly methods won’t pose any danger to your family or pets. Ready to get rid of ants right away? Contact Home Pest Control today. 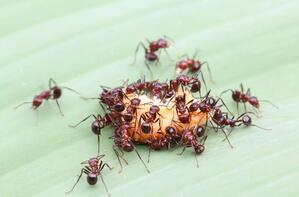 Perhaps more than anything else, a messy home is the most common cause of an ant infestation. Food and sticky spots on counter tops, dirty floors, and an uncovered trash can can all lead to an ant invasion. A few initial ants will scout out the premises, note the presence of available food sources, and then return to the colony with word. Before you know it, you could have a kitchen full of ants. What’s the best way to get rid of the ants in my kitchen? Ants show up in a number of different places in the kitchen. Sometimes you’ll encounter them around the sink. In other cases, ants will appear in cupboards or crawling across counter tops. Unfortunately, there’s no single strategy that’s guaranteed to get rid of ants once they appear in your kitchen. Ant baits can be effective for certain species, while other types of ants will ignore the bait altogether. Contacting a professional here at Home Pest Control is the best way to address an ant invasion. Are ants a serious problem? Certain species are known to carry bacteria on their bodies, and these bacteria can potentially contaminate the food that the ants come into contact with. Carpenter ants can cause structural damage to your home, much in the same way that termites would. Meanwhile, the bite of a fire ant can result in an intensely painful reaction, including a potentially life threatening allergic reaction in sensitive individuals.